1) Have you had an adventure like those of the bears in your books? Yes, I can think of a number of books. The Bike Lesson is based on my attempt to teach our first son, when he was about five or six, to ride a bike. There are many others. 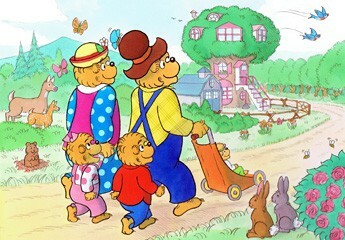 The Berenstain Bears Go to the Doctor is based on our experience taking our two sons to the doctor. Many of our books are based on real experiences. One of our books is called The Berenstain Bears’ New Baby. That was based on our experience becoming new parents. We already had one son and the other one was on the way. Our son noticed that Jan’s lap had gotten a lot smaller. After the baby was born, he sat on his mother’s lap again and said, “Momma, you’ve got your lap back,” and that’s in that book. So the answer is that most of our books are based on experience – some more than others. 2) Are the little bear characters anything like you were when you were a kid? I think so. Sister Bear likes to jump rope and is a lively little girl, just like Jan. I was an avid model airplane builder when I was young, and that’s one of Brother Bear’s hobbies. I think Brother Bear is a better athlete than I was as a child, although I was very enthusiastic. So yes, I think they are like us. I don’t think it was any grand plan, but it’s just worked out that way. 3) Where did the idea come from for Mama’s New Job? That book is about ten years old. Many of the people we work with, editors and so on, are working mothers, so we’re very aware of that. About that time, feminism was very much in the public eye, and we read a statistic that about half of all the mothers in the United States had jobs as well as being wives and mothers. We thought it was an important subject, and we gave it a shot. 4) What gave you the idea to write the book No Girls Allowed? That’s a good question. Jan, when she was a little girl, was about the only girl who lived on that street. She had two brothers and they did their best to shut her out. But Jan, being a very spirited girl, didn’t let them. So that’s where that came from. 5) How long have you been writing? We’ve been writing pretty much since we were married about 54 years ago, but we weren’t writing for children. We were writing for adults. We’ve both been drawing since we were about 3 or 4 years old. 6) Do you both write and illustrate? We both do both. That’s always been the case. We drew before we wrote. We met in art school. The writing followed the drawing, and we continue to do both. We think up an idea for a story first, then think up a cover and draw that first. Beyond the covers and titles, we write the story together, then rough out the pictures in a general way. I generally do the rough sketch, and then Jan does the beautiful drawing on art paper, then we share the job of coloring it. 7) What kind of tools do you use to illustrate your books? We use pencils to begin with. We also use Flair pens, often different colors to color-code the layouts. Once we get past the layout stage, we use India inks and old-fashioned pens where you put the nib in the holder. We don’t like some of the new kinds of pens – partly because we’re old-fashioned and stuck in our ways, but partly because we think it’s important to be able to vary the weight of the lines and you can’t do that with the mechanical pens. For coloring, we use a liquid watercolor that comes in bottles, called Dr. Martin’s Dyes. They’re very clear, very transparent, very bright, and we love them dearly. 8) How long do you plan to continue writing Berenstain Bears books? We’re going to keep on doing it until we get it wrong. That’s my standard answer. Note: Though Stan died in 2005 and Jan in 2012, their son Mike continues to create the delightful Bear adventures from his studio in Pennsylvania. I *loved* “No Girls Allowed” when I was a kid. So fun to hear the story behind it!